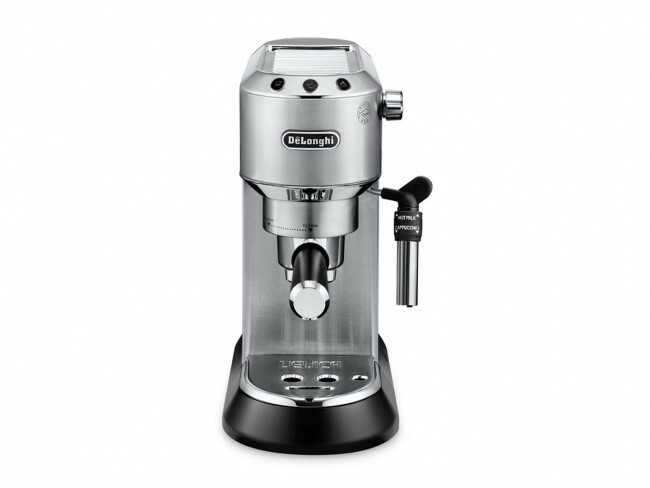 The DeLonghi Dedica Deluxe brings a new set of updates to its slim classic semi-automatic. A slim, sub-6" case helps the Dedica Deluxe fit in small spaces and crowded kitchen counters—now with the option to brew into larger 5-inch tall cups and mugs thanks to a removable 2-stage drip tray. 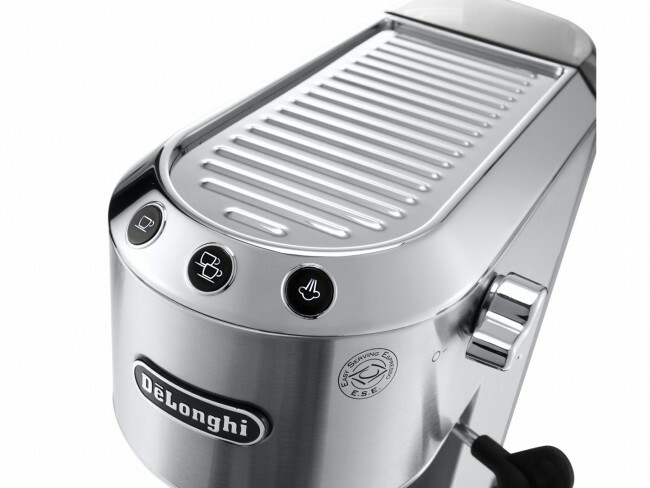 DeLonghi also brings updated milk steaming prowess to the Deluxe with an adjustable panarello that lets you switch between straight steaming and auto-frothing with the quick slide of a sleeve. Other brewing niceties include automatic shot buttons; a pressurized portafilter with single, double and ESE pods; an automatic power saving mode; and a demitasse-size cup warming tray. Slim Case - An ultra-slim layout lets the Dedica squeak between other kitchen appliances with ease. Programmable Shot Times - Set extraction times for both single and double shots. 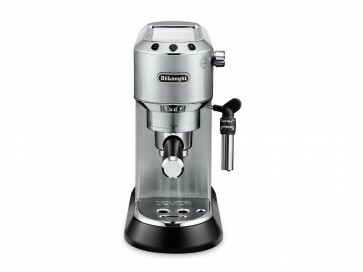 Adjustable Milk Texture - A sliding adjustable nozzle on the panarello steam wand lets you dial in milk texture easily. Adjustable Cup Clearance - Remove the lower cup tray for an extra 2 inches of clearance. Pressurized Portafilter - The Dedica Deluxe's pressurized portafilter gives you more coffee flexibility than non-pressurized options. Milk Adjust - The new milk adjust system aids in making steadier microfoam or thick, creamy cappuccino foam. Narrow Footprint - Most machines tend to bloom outwards, taking up always-needed counterspace. the Dedica Deluxe's 6-inch stance saves space in even the smallest of kitchens. Auto Purge - When switching between brewing and steaming, the Dedica automatically pauses and purges to help release heat from the thermoblock. Soupy Pucks - Pressurized portafilters are great for convenience, but tend to leave more of a mess. It doesn't help that the Dedica's portafilter has a tendency to loose its basket when knocking out the aforementioned mess. 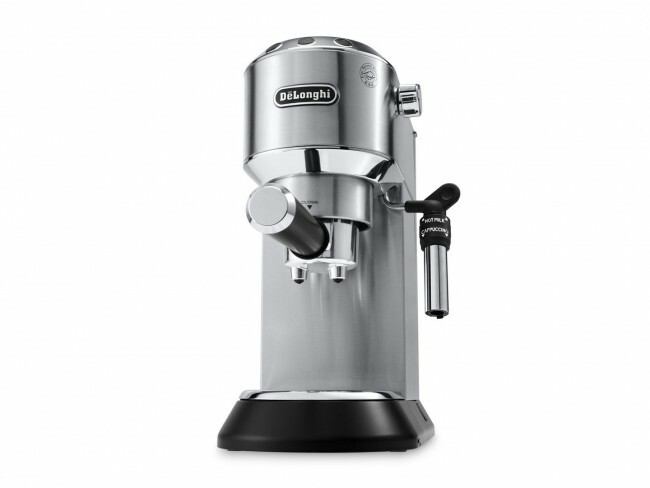 Similar to the original Dedica (EC680), the new Dedica Deluxe (EC685) adds an adjustable cup height and an updated panarello wand that lets you choose from regular steaming/heating and panarello auto-frothing.